Eileen Davidson's second "Soap Opera Mystery", Dial Emmy for Murder starts more dramatically than many cozies, but, of course a mystery set in the world of soap operas should start dramatically. And Davidson's mystery uses many of the soap opera formulas. Alexis Peterson recently moved from one soap opera to another. As the star of The Bare and the Brazen, she's popular on the red carpet before the Daytime Emmys. She's just as popular with the paparrazi after her co-presenter's body falls from the rafters at the Kodak Theater, dripping blood on her before he tumbles to the stage. She's already familiar with the police detective who shows up, Detective Frank Jakes, so its easy for him to ask her to work with him, probing into the world of soaps. Alex takes the murder seriously, but quickly gets caught up in the detective business, thinking, "I was in amateur detective mode and he was spoiling my buzz." And, Jakes, who has fallen for Alex, allows her to accompany him on his investigations, as they discover that the dead man looks quite a bit like a few other recently dead actors. I started by reading this book as a cozy mystery, thinking it was not well done, using every overused, cliché in the book. Then, I realized if I read it as it says in the series title, as "A Soap Opera Mystery", it's a funny send-off of those shows. Take an actress who can't make up her mind between two men, one a police detective. He's a hunk, sexually harassed by his boss. Throw in the best friend, a gay hair dresser. There's an embezzler ex-husband, out to take away the soap star's darling daughter, when he reappears from nowhere after a three year absence. And, Davidson throws in all of the plot formulas that readers dislike in mysteries. Alex goes off on her own to talk to a suspect without telling the cops. When she gets to his place, and finds the door ajar, she has three choices, get out, call 911 or open the door. Naturally, she'd pick number three, and we all know what happens when a heroine opens the door! Body in the bathtub! Of course, there's the scene when someone tries to run Alex off the road. And, a combined satire of the cozy genre and soap opera has to have a terrible stage mother with a wimpy son. Eileen Davidson's Dial Emmy for Murder is either a poorly written cozy, or a terrific take-off, combining soap formulas with the cozy genre. I prefer to read it as a clever take-off, or I would have been very unhappy with the comment, "You look...severe. Like a librarian." But, it's my guess that Davidson is clever, poking fun at the soap opera world she knows so well, since she starred in The Young and the Restless, The Bold and the Beautiful, and Days of Our Lives. 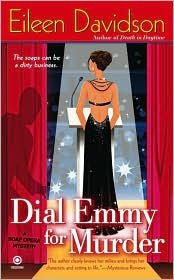 Dial Emmy for Murder by Eileen Davidson. Obsidian, ©2009. ISBN 9780451228253 (paperback), 294p. I love how you described it as "either a poorly written cozy, or a terrific take-off . . ." Yes, let's hope it is meant tongue in cheek. :-) Thanks for your great review, Lesa. You got my meaning exactly. I'm hoping it's a brilliant take-off. I hope it's a take-off too. I have both her books in my TBR. It has to be, Yvonne. Nobody could put that many clichés in one book. They might get the first one published, but the second one, too? Has to be a take-off. Do you think I oughta check it out? Only if you're willing to look at it as a complete take-off, Gautami. If you treat it as a straight cozy mystery, it has a lot of flaws. As a satire, it's funny. I have a mysteries category in my 999 Challenge on LibraryThing, but have been getting tired of the standard cozy, and need something lighter than some of the gripping psycho suspense thrillers. This sounds perfect. Thanks for such an insightful review. You're welcome, Tina. I hope it fits the bill!